The base in Guadeloupe is located behind the Marina of Pointe a Pitre on the shore of Lagoon Bleu. From the USA, you can fly with American Airline via San Juan. There is one airport in Guadeloupe, Le Raizet Airport, which is north of Pointe a Pitre. To clear Guadeloupe customs, everyone should have a passport and a return ticket. After you clear customs, you will find taxi drivers waiting just outside the exit. The base is located approx. 10 km from the airport. There is a marina supermarket approx. 10 minutes walk from the base and a larger supermarket approx. 5 minutes away by taxi. Most shops open weekdays from 8am-12pm and 2pm-5pm. Some do stay open later. At weekends they generally only open on Saturday mornings. As space is limited on boats (and airplanes!) please pack light and use easily storable duffel bags. Casual wear is appropriate everywhere in Guadeloupe. Be sure to bring a jacket/sweater/sweatshirt or rain slicker, for the occasional cool evening or windy weather. Good boat shoes with non-slip soles are a must. 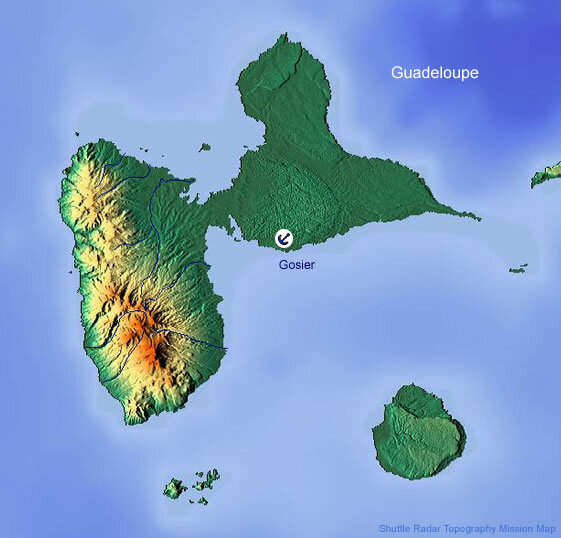 Average temperatures on Guadeloupe hover around 74°F during the winter months and 87°F during the summer. The nearly perfect sunny weather is moderated by northeastern tradewinds which bring refreshing breezes. Seasons in Guadeloupe are not distinguished so much by temperature as they are by rainfall. July through November is the wettest and most humid time of year. December through May is considered the dry season, but unexpected rain showers can happen at any time of year in Guadeloupe. For the most part, showers are short lived and give way to sunshine within a few minutes. The Euro is the island currency. Hotels, larger restaurants and car-rental agencies accept Visa, American Express and MasterCard. Avoid changing money at hotel lobbies, where the rates are worse than at exchange offices or banks. Currency exchange offices, called bureaux de change, are scattered around Pointe-à-Pitre, and ATMs called ABMs, distributeurs de billets or distributeurs automatiques will usually give good rates. There are banks with cash-point machines in the town, approximately 3km away. US$ are accepted in the Marina supermarket but the exchange rate is not very good – it is advisable to take Euros. The Marinas facilities include showers/toilets, a restaurant, a bar, a chandlery, a re-fuelling dock, a launderette and a provisioning store. Your yacht will be ready at 1800 hrs for boarding. Please be aware that the yacht and chart briefings will be arranged on your arrival. At the end of your charter your yacht will need to be vacated by 0900 hrs so we recommend that you return to the base the day before. Bridge Opening Time: The River Salee has two opening bridges close together which work as one. They open daily (except for Sundays) at 4.30am for North to South crossings and 5am for South to North. You must be geared up and ready before then if you wish to go through. It is easy to anchor close to the bridges. Upon boarding your charter boat will have a full tank of diesel fuel and water. We recommend that you purchase drinking water and use the water onboard for bathing. You can generally purchase more water at marinas, but they do charge you by the gallon, so use water sparingly. Please return your charter boat full of fuel and water.